Besides being a huge Android dork, I spend most of my time reading comic books. While I’m definitely partial to the nice feel of glossy paper, the transition to digital comics has had its own advantages; like digital sales of games, it makes things easier when older titles might be out of print, or rare to find. 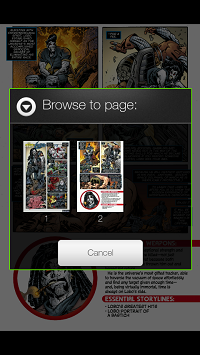 While Android has had a fairly nice comic viewer on the market for awhile in Droid Comic Viewer, a problem arises in the fact that it’s used for viewing .cbr and .cbz files. These formats (Comic Book Rar and Comic Book Zip, respectively) are fan-created, and usually used for possibly-pirated scans. In short, there’s no way for big publishers like Marvel and DC to release their titles in this format without opening themselves up to the possibility of piracy. 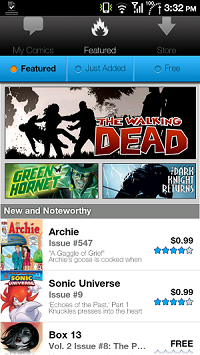 ComiXology somewhat solved this; formed in 2007, they gained prominence through offering a way for people to get comics digitally while remaining secure. They gained credibility by offering what many digital stores lack: selection. The company partners with Marvel, DC and many other smaller publishers to give a comprehensive comics package to fans who’re looking to read their comics on their phones or tablets. While apps have been available for iPad/iPhone for awhile now, the Android version is just making its way to the marketplace now. And no, this app is not some cobbled-together port of the iOS app. It’s a fully featured, well-crafted program for reading comics on a touch-enabled screen, and a competent, functional marketplace to go along with it. It takes what comic collectors need, like a well-organized library, and makes it accessible to the average user. The company has clearly put some work into this app, and it shows through. I mention this user-friendliness because all too often have I loaded up an “indie” app and found it a pain to use; sometimes it’s worth it to pay for quality. 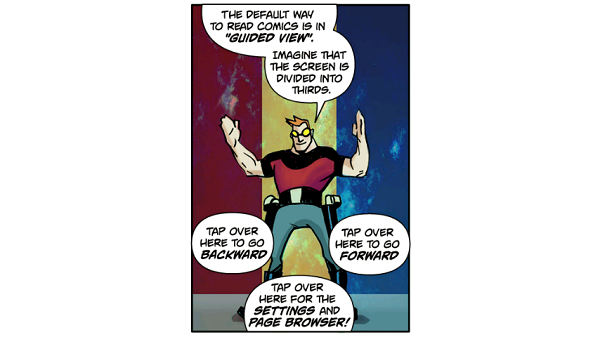 Navigation of comics is achieved through a rule-of-thirds tapping system, along with pinch-to-zoom gestures. This is all well and good, but the program sometimes makes assumptions to where you want to go; the tapping motions sometimes take you panel-to-panel, or top-half of a panel to bottom-half, or page-to-page. It just makes things confusing when they aren’t consistent, so more often than not I’m looking at the fully-zoomed out page, tapping or pinching to zoom in where I want to see. This is a more intuitive system, I find, because the user’s in a lot more control. They don’t have to worry about missing anything, just because the program hasn’t defined it as “in order”. I applaud them for trying, though, and having a comic-based tutorial earns ComiXology points. The marketplace and library are easy to navigate and sort, which is imperative. You can sort and search by author, keyword, publisher, artist – pretty much anything you can think of. Purchases are tied to your account, and you can download and view them whenever you want. As far as I know, there aren’t any DRM measures that give you a certain amount of downloads; for those of you familiar with Valve’s Steam system, it’s a lot like that – you buy comics through the service, and have to use them through the service. 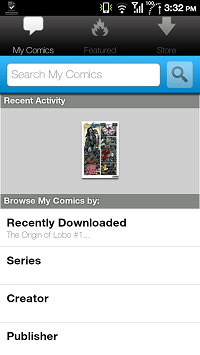 There’s no way to view your comics outside of the app. However, prices are set by individual companies, so there’s little consistency between issues. One thing that I found in the market is that you can’t rate comics until you buy them. I thought this was a novel way of keeping review spam down and eliminating the drama of getting those good reviews. Yelp and Amazon annoy me with that latter practice. 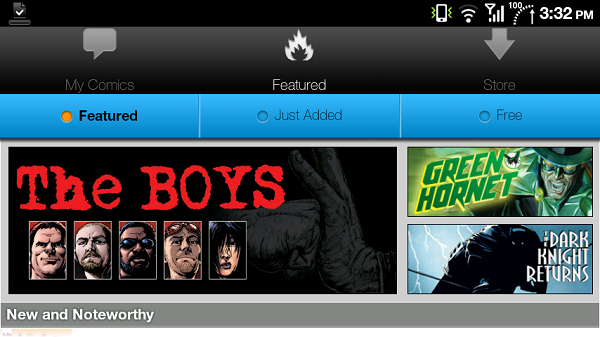 But otherwise, if you like comics and don’t mind reading them on your phone/tablet, pick up comiXology. They have the selection monopoly, the ease-of-use and the system to make it a successful venture. I, however, won’t be, because I like the look of a shelf full of books, or a longbox full of single issues. That’s just me, though.